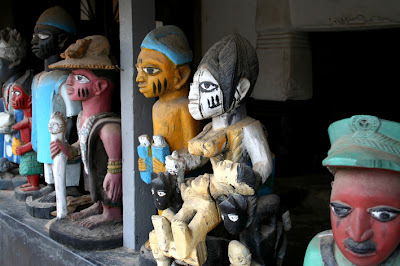 The Oba's Palace, Abeokuta (the town's name means 'under the rock' - Olumo Rock). Jeremy can those things talk? "If we leave our gods and follow your god," asked another man, "who will protect us from the anger of our neglected gods and ancestors?" "Your gods are not alive and cannot do you any harm," replied the white man. "They are pieces of wood and stone."